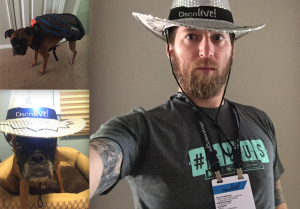 This year I was unable to make it to Cisco Live U.S. for a variety of reasons. Sometimes the stars don’t align and you can’t make logistics work, or maybe financials just fall short. 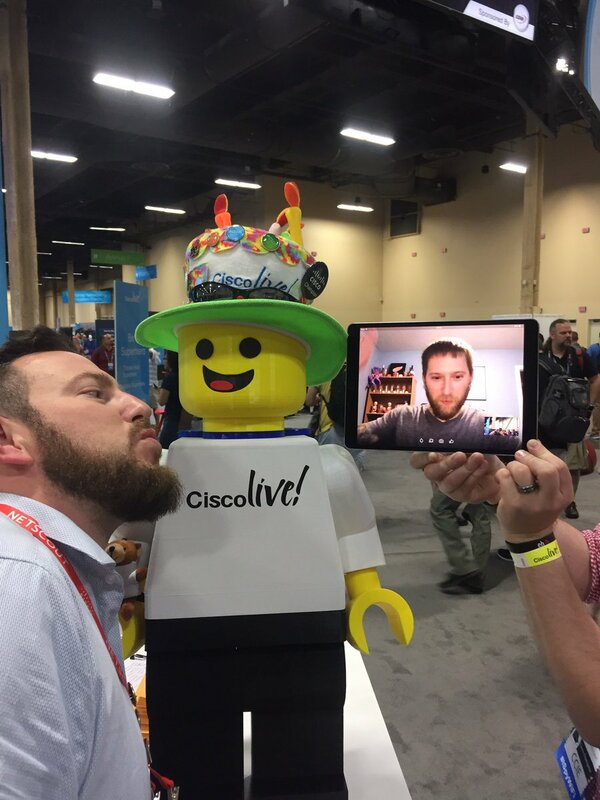 That doesn’t mean you can’t “go” to CLUS even if it may be remotely and in spirit. Trust me, if the spirits right it’s an exhausting week even when you aren’t there. I dedicated a lot of effort this year into “attending” even though I was remote just shy of a couple thousand miles away. Here’s how I did it! I guess to start I should say I may have went a little overboard this year. To start out me and my pup got geared up in last years swag to get in the mood for the Sunday opening Tweetup. Feel free to shame me on being a little too excited about an event I wasn’t even at but come on, I had a blast all week. First and foremost ciscolive.com was a go to center for information. They had details about keynotes, speakers, etc. They had a great list of events and which ones they were broadcasting. This allowed me to put highlight broadcasts in my calendar such as the opening keynote and of course the closing keynote which allowed me to watch them. They key to these keynotes was participating online with friends, colleagues, and event staff by means of Spark Rooms, Ryver Rooms, Facebook, Twitter, and occasionally even good ol’ text messages. To further the live video information firehose we had the likes of some very awesome podcasters that seemed to take over CLUS this year. It was awesome being able to see outside parties insights to the event and not only talk technology, but also just talk about the experience of being there and get a public view of it all. Thanks to Network Collective, TechFieldDay, Whiskey and Wireless, and all of the others that took over and recorded podcasts or delivered live streaming events. Of course, to keep with an important theme in this post on how I was able to keep involved. All of these podcasts have a great twitter presence which allowed easy interaction from remote during their recordings. Of course, I have to mention twitter and how relevant it is to the Cisco live experience. I must preface it though with the fact that where in person, or remote during or after Cisco live. 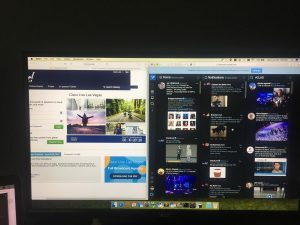 Twitter is the go to channel for communicating with friends, colleagues, and like minded geeks throughout the year. If it weren’t for them, the remote or in person experience just wouldn’t be the same. 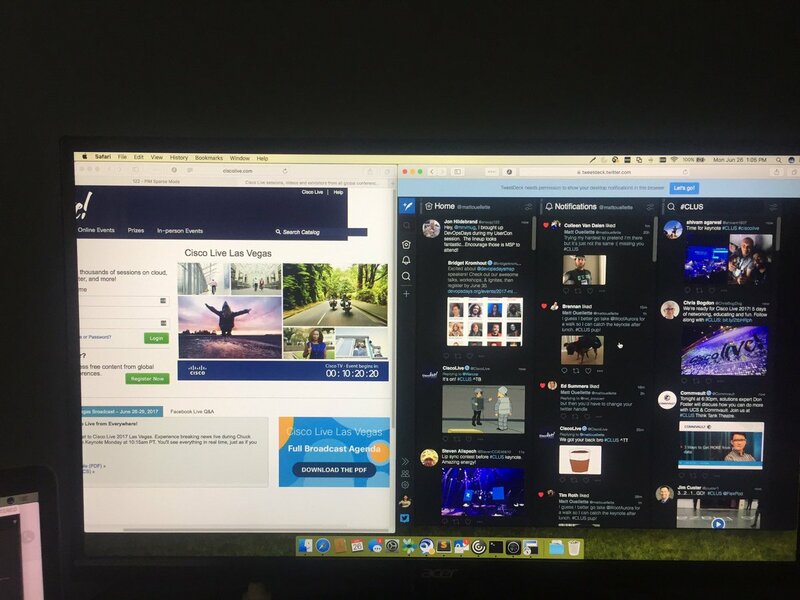 Throughout the week the entire crew running @Ciscolive, the folks in the Social Media Hub chasing down #CLUS, and everyone else interacting on twitter were total rockstars. I had near real time communication with various people all day and all night. They never missed a beat and because of that I felt involved as if I was in person having those conversations. Thanks to Twitter and a few creative people there was the fun and excitement of getting a selfie with “Figus” and The Cisco Live Hat. I have some pretty cool friends (Brennan and Stewart) who helped me out through the use of technology to get my very own selfie with them both. Just a little bit of fun being at the conference, all the way from my house. Such a cool creation that sparked the conference in person and remote. Thanks for the magic Rob! There was a large theme this year at Cisco Live. Spark! I’ve been in Spark rooms for a while now. Occasional video calls with friends from last year to keep in touch. The Cisco Champion room where collaboration is such a wonderful thing. This year, I was lucky enough to be on a Spark call with Marena when the one and only Silvia noticed and the two of them managed to get me on a Spark Board. Here I was, thinking I was on a small video call but nope, I was on a big screen smack dab in the middle of the conference. What a surprise! It was really cool to be able to utilize the technology to literally “be there” on such a large scale. I guess that’s one way to attend remotely. Then there was the CAE. Last year I witnessed quite a few people make the good ol’ call a friend during the concert to let them experience the fun. This year, my friends did that for me when I couldn’t make it. Such a great way to wrap up an exhausting week of keeping up with technology and session discussions online, watching keynotes and using technology to visit the conference live and in (video) person! I guess I should summarize how I found it possible to attend the conference even when I wasn’t there. Follow Ciscolive.com, Cisco Live on Facebook, Cisco Live on Twitter. Follow them on everything you can and you’ll catch great information as well as broadcasts and hot topics around the conference. Follow the great podcasters and live video presenters. They are at the conference doing what they do so you can see see the communities response, what they think is relevant, and how the conference feels in person. Engage on Twitter. I can’t stress this enough. People tweet what session they are going to, interesting facts about the session, responses to the session, and everything in between. Scott McDermott and Daniel Dib did an absolutely fantastic job this year providing this insight. Most of all, have fun! Insert yourself. Participate in hash tags with vendors, Cisco, podcasters, the whole nine yards! Talk with your friends and colleagues that are there via any means possible. Spark, Slack, Twitter, Facebook, etc.